When you think of camp cooking setups, what do envision? 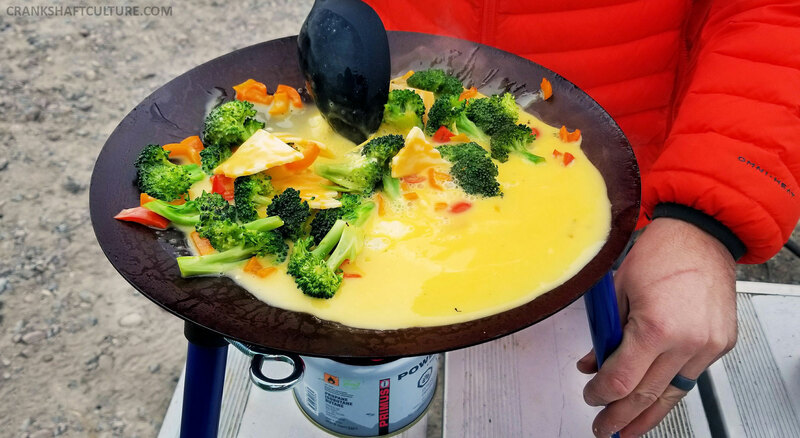 Do you think of the two-burner Coleman stove you inherited from your grandpa, or the heavy cast iron pots and pans you lug along to make your camp meal? Maybe scratched-up bargain basement Teflon pans? Perhaps just freeze-dried backpacking meals you pop into a bowl so you avoid the whole cooking thing altogether? Well, there are new ways of camp cooking. We introduce to you Tembo Tusk and its Adventure Skottle. The Tembo Tusk Adventure Skottle atop one of the many rocks of Alabama Hills, California. 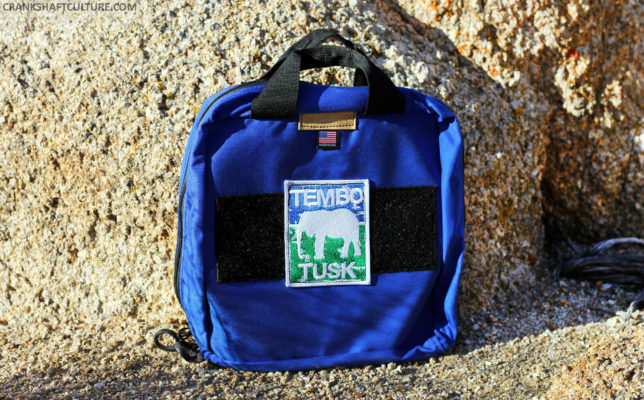 Tembo Tusk started in 2010 after its founders realized they couldn’t find camping or cooking gear that accommodated their on-the-go rugged lifestyle. They desired products that held up to extreme conditions. Gear that could last for years, be easily transportable, and perform solidly in a variety of conditions. One such product they created for camp cooking is the popular Skottle. And now the company has come out with a more compact, portable, and lightweight Adventure Skottle—the smaller cousin to their original full-size Skottle grill. The Skottle is Tembo Tusk’s innovative take on an old cooking method that utilized old harrow discs used by South African farmers to cultivate their fields. Tembo Tusk’s discs didn’t come from plows, but they do come complete with a pre-seasoned cooking disc, a place for a stove to be mounted underneath, and a tripod of quick-release legs. The Adventure Skottle is “convertible” enough for many types of meals. How big is the Adventure Skottle, where’s it made, what comes in the package? The Adventure Skottle comes pre-seasoned so you can assemble and cook! The US-made Blue Ridge Overland carry bag comes with each Adventure Skottle. Size comparison between a Tembo Tusk Adventure Skottle and a Coleman fuel canister. Now that you know a bit about the Adventure Skottle, let’s talk about the most important part after assembly: Cooking. Andy using plastic utensils to cook on the Tembo Tusk Adventure Skottle. The Adventure Skottle is designed for adventurers: motorcyclists, kayakers, hikers, overlanders, and folks who travel lightly or compactly (like us), or backyard cooking enthusiasts. It’s made for those who want a universally well-made and simple cooking system. Those who want to pack small, light, and smartly. Our first meal, a breakfast scramble, turned out pretty darn tasty! 1. Make sure you have cooking oil. The Tembo Adventure Skottle comes pre-seasoned so you can cook on it immediately, but it’s likely you’ll still need some oil. Unfortunately for us, we were in the middle of Death Valley camping out of our van and discovered our oil had turned bad and created a sludge-like consistency. Thankfully we found a store that had some two days later. You’ll not only need to use the oil for cooking food, but also for cleaning/seasoning the Skottle when you’re finished cooking. Cooking oil is essential to clean the Tembo Tusk to get it ready for its next cooking adventure. 2. Make sure you have a level cooking surface. This unit comes with three non-adjustable legs that mount to the Skottle pan with eyelet screws. 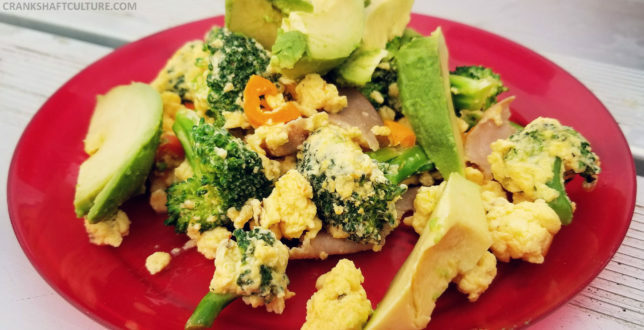 Make sure you plan your cooking extravaganza on even ground before cooking away—our first morning we made a killer egg and vegetable scramble but quickly noticed we were on an unevenly tilted surface. The eggs ran to one side of the disc lip. Quick fix: shim the problem leg into level position. It’s important to cook on a level surface otherwise you may have food slipping off your disc. 3. Clean up is easy—if you know how. The best way to clean your slick disc of cooking happiness is to pour oil into the pan with a good bit of rock or sea salt and vigorously scrub the pan with a paper/cloth towel. For ultra-stubborn situations, heat water to a boil (in the Skottle) and soak to loosen food particles. Scrape the surface, then clean and lightly oil to prep for your next cooking excursion. Don’t use plastic or metal spoons with lukewarm water to scrape off stubborn food like we did with our first use. It doesn’t work so well. Ask us how we know. It took a bit of time and wasn’t extremely effective. Rock/sea salt and paper or cloth towels are the best way to clean your Tembo Tusk. 4. Wood/silicone utensils are best for cooking on the disc, plus they make clean-up easy. After we got ourselves sorted out and prepared with oil, even cooking surfaces, and a method to clean the new disc, we were armed and ready to cook again. The Tembo Tusk in action. 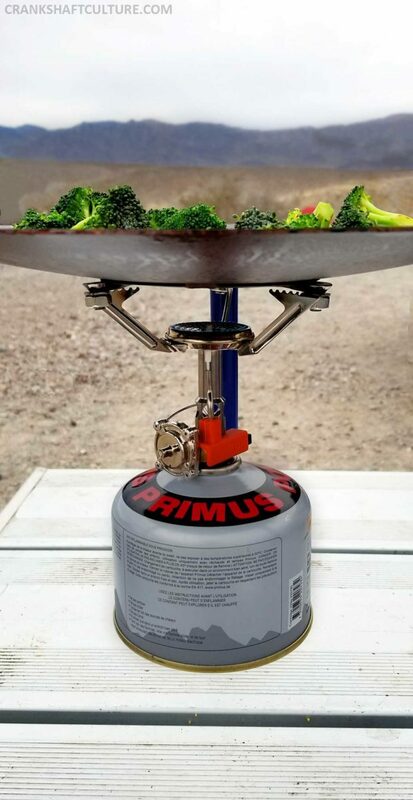 This Adventure grill gets hot very quickly and cooks food in no time (the center 8″–9″ of the disc is the hottest cooking area, while the outside perimeter is to keep food warm). Cook what you want and if making multi-part meals, push what’s cooked to the outer edges and cook what’s new in the center. The Adventure Skottle can tackle simple meals like sausages and broccoli, or take on more complicated ones like a hearty multi-course breakfast with scrambled eggs, bacon, toast, and hash-browns. 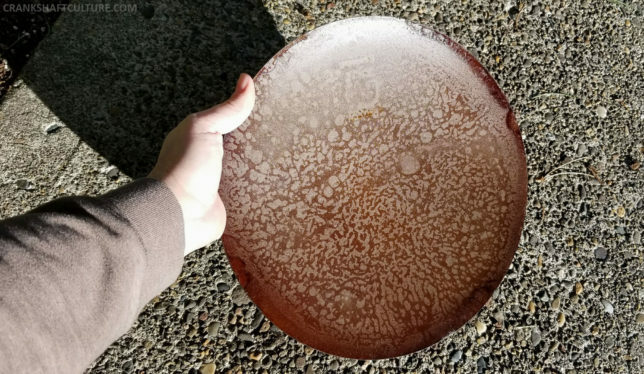 Cooking in phases for complex or larger meals may be necessary as the Adventure model has a 12” diameter disc vs. the full-size Skottle’s 18″ diameter. This grill is just right for 1–2 people. If you’ve been on trails all day long and are mammothly hungry, you may need to make a few rounds of food: prosciutto-wrapped asparagus appetizer, steak and cubed potatoes dinner, along with fresh cookies for dessert. I am hungry just thinking about that! Keep in mind Tembo Tusk even has a Skottle cookbook for download; there’s a plethora of yummy recipes inside (including cookies!). If you’re interested in a unique, easy, and interesting way of cooking for yourself or you and a buddy, the Tembo Tusk Adventure Skottle certainly fits the bill. It’s compact, easy to use, and is just plain cool. Although on the expensive end of outdoor cooking systems, Tembo’s focus is to offer American-made products that are durable, long-lasting, and will continue to serve you for many years of meals. The company is easily accessible should you order more product or have questions. They are active via social media and will respond to your email or phone query in a snap. To us, a US-based company that is reputable, designs and sells quality products, and can easily be contacted is very important. We’re impressed. Give them a try; use promo code “cranskshaftculture” for 5% off your order via tembotusk.com! 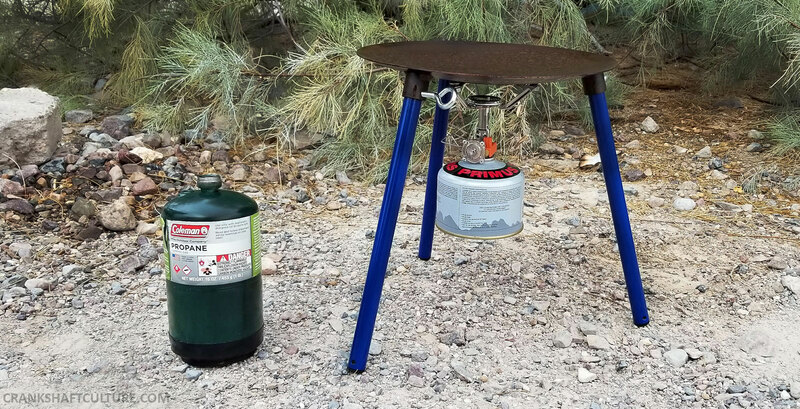 Jetboil’s Mighty Mo stove is sold at many outdoor brick and mortar and online retailers. Might Mo without Tembo attachment. Quick Tembo attachment install via allen wrench. Finished stove ready for disc install. Mighty Mo mounted on disc. Eyelets used to mount legs to disc. Eyelet screw marks on Tembo legs. Spacing between legs, important to know in case you cook on small surfaces.